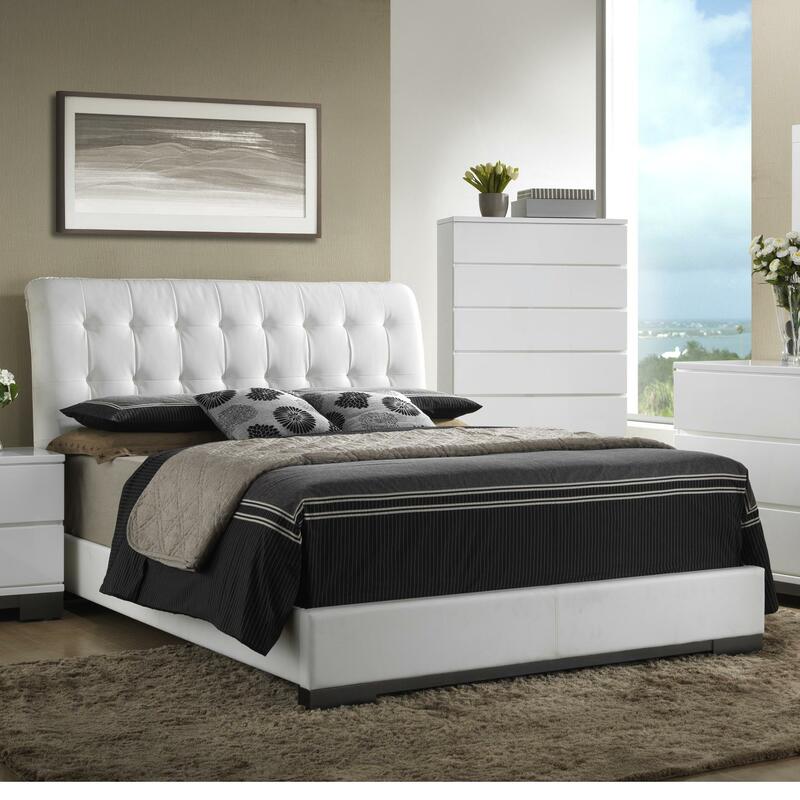 Sleek and modern this upholstered bed will fit into any contemporary styled master bedroom. The low profile footboard and rails allow the tufted headboard to become a focal point for the room. The headboard features a slight curve to continue the eye-catching silhouette. Brighten your home with this lovely upholstered bed. The Avery Contemporary Upholstered King Bed with Tufted Headboard by Crown Mark at Household Furniture in the El Paso & Horizon City, TX area. Product availability may vary. Contact us for the most current availability on this product. Avery emanates a sleek contemporary style to create a modern master bedroom. Clean lines are highlighted in a bright white finish and accented by a deep brown color on the bases of each piece. The bed features a low profile footboard and rails to showcase the high tufted headboard to create a focal point in the room. Drawer faces are left bare and are paired with generous block feet to complete the modern design. Add this bedroom collection to create an open and bright effect. The Avery collection is a great option if you are looking for Contemporary furniture in the El Paso & Horizon City, TX area. Browse other items in the Avery collection from Household Furniture in the El Paso & Horizon City, TX area.